Members of the Cleftlands train to participate in medieval-style combat using rattan swords in place of steel. Whether it’s a friendly bout among friends, a tournament reminiscent of the past, or in large scale battles with hundreds of other combatants, all activities are under the watchful eye of safety marshals. 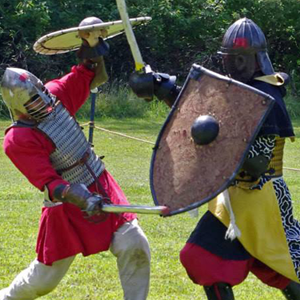 If you are interested in learning more about armored rattan combat in the Cleftlands, please contact our Knights’ Marshal or come to a Wednesday practice and see for yourself.